The Cigar Advisor Competition is now CLOSED and the results are in!!! The Cigar Advisor Column arose out of a casual conversation when the Editor of C. GARS. LTD and I were having dinner together in my house in June. He asked whether I would be interested in writing something for his website. I said why not? I wanted to do it just for fun. I still am. That is why you sometimes find my answers are quite funny! I did not anticipate many questions and much readership. It will perhaps last for only a couple of months and die. But something unexpected has happened. I was informed the readers are taking my answers very seriously. I think it is a big discourtesy not to be serious to people who take me seriously. That is probably why you have found my answers are becoming longer and more sophisticated. And I insist not to disappoint anyone. I will answer every single question submitted. I want to disclose all useful information that I possess for my readers as early as possible. That is why I sometimes say something in details quite unrelated to the question (for example, the August question on Partagas Selection Privada No.1). But I have decided that rather than waiting for the opportunities to pop up I want to take the initiative to provide my readers with the most important information they need to know. That is where and how to get information. How to handle the information you get. How to think correctly. How to manage to get the best and most rare cigars from your tobacconist and how to prevent becoming a victim of lousy 'professional writers' and lousy cigar merchants. Once you are provided with this knowledge you will no longer need to rely on someone to tell you and you can find out yourself. And if you wish, you can continue to improve your knowledge on Havanas much quicker and better than other people. This is the task which I absolutely believe I need to complete before I go. The questions of the Competition are designed for this purpose. Each question carries a message I want to deliver. Some cigars are discontinued and some are 'resurrected'. Which particular cigar has the most unlikely chance of being produced again in the future? Name the brand and the particular model with reasons. The only cigar that I know of being forced to be discontinued by a non-cigar related organisation. Chateau d'Yquem is more interested in protecting their name than for financial gain. They will not even produce their own wine in a year that they consider not fit for the name Chateau d'Yquem. For the story, you can refer to the Cigar Aficionado Autumn 1993 issue â€œCollector's Dream : Cuban Davidoffsâ€� (the one with a black and white photo of Winston Churchill as cover, but no Vol. and No. stated). If you do not have a copy, you can search the article in their website. The exact year they quoted was wrong, it was 1982 and not 1984. Do not waste your time to speculate on anything. Cigars were discontinued for quite unknown reasons. They can be resurrected for quite unknown reasons. Most people quoted Davidoff as the brand, but I can see no reason why Davidoff cannot go back to Cuba in the future. Sentiments are never an obstacle when mutual benefits are again found. Commercial decisions are based on commercial interests. No reason is needed. Of course when asked. A reason can be invented. And more on commercial interests and sentiments.. The Cubans are sometimes criticized for not promoting their products well enough. They do not need to. Demand always exceed production. You seldom can find a cigar more than two year old. Actually you should thank them for not doing it to increase price. They are not that particularly commercial. And there are criticisms on why rare and sought after cigars are priced the same as others and unfair. It is actually fair. That is if you buy the ideal of REAL communism (What is IDEAL communism? My version of course. Since this not a forum for political debates. Next Time!). Rare and sought after cigars should be 'rationed' to people who deserve them and not to people who have more money. How you can manage to obtain these cigars from your tobacconist. Recommended selling prices are set by Habano S.A., not by authorised importers. 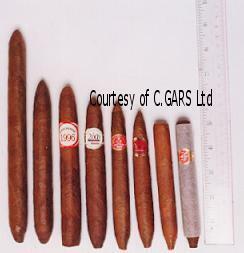 Authorised importer then provide cigars for vendors, no special recommended selling prices are given. But vendors which charge outrageous prices for those cigars to make huge profits will not be supplied with cigars any more. They cannot sell them at 'black market' price either. They cannot afford the unavoidable risk of being 'busted'. The best option left is to 'ration' shipments of rare cigars to people who can impress them. Tobacconist are typically quite sentimental about the products they sell. The way to impress them is to prove that you have real knowledge. Grumbling about bad cigars will not help as bad cigars are not their fault. The worst thing you can do is to say that a cigar is bad but actually it is not. They will reserve better cigars to better customers and not to time wasters. That reminds me of an article I (and probably you) read very recently strongly criticizing the Cubans of something. He even offered his 'better' cigars to his hosts in Cuba. Of course his 'courtesy' was politely refused. The person who writes the article does not realise he has zero knowledge about cigars. Of course the Cubans have made some real not-too-good decisions recently. But who hasn't? They are correcting themselves pretty quickly. Which is the rarest double coronas ever produced in the post-Revolutionary era ? (A cigar that has its own specific commercial production number). Read the question carefully. I did not say 'to the best of your knowledge' or 'reference need to be provided'. If anyone dares to name a model, they are claiming that they possess a comprehensive knowledge of what exactly did happen over the past 42 years. Nobody can do that. Not even the highest Cuban official in charge. As a lot of things are classified. But I think my readers would like to know what is 'to the best of my knowledge' the rarest double coronas. My answer is San Luis Rey Double Coronas and not Saint Luis Rey Prominente.. Exactly what did happen? There is a big intrigue there and I am currently researching on the subject. This question was asked by one of my readers and I did not elaborate on the issue. I can write a whole book about this but what's inside is nothing but speculations. 1. Are Saint Luis Rey and San Luis Rey the same brand? No! They are not. But yes! They were! 2. Are Saint Luis Rey Prominente and San Luis Rey Double Coronas different cigars? Yes! 3. Which is rarer? The San Luis Rey Double Coronas! 4. Was there a Saint Luis Rey Double Coronas? No! 5. Was there a San Luis Rey Prominente? No! Just one say don't know. I will take those who did not answer the question as having a correct answer. There are two persons. (It's funny isn't? By not answering a question you can give a correct answer!) Most say Saint Luis Rey Prominente. None say San Luis Rey Double Coronas or Saint Luis Rey Double Coronas, despite the entry in Charles del Todesco's 'The Havana Cigar' and Perelman's 'Pocket Cyclopedia of Havana Cigars' clearly state the model name is Double Coronas. It is so difficult to say you don't know! But many writers about Havanas, instead of saying they don't know, they invent a lot of things to make sure they know everything. If you are infected by the same mentality, you will be forced to buy many of the pseudo-intellects invented. You do not need to know everything. And you cannot. What is the single most popular production vitola (or size if you like) in the fifties? (References need to be provided). Exact vitola : Palmas 6 & 3/4 inches rg 33. (or size if you like) : long slim panatelas. And I will also take small panatelas, long panatelas or slim panatelas as the correct answer. Three. I insist that only answers which came with a reference be accepted. Otherwise this becomes a lottery. It is also interesting that for answers which came without a reference (about 2/3), none of them is correct. Any reasonable reference is acceptable. In fact one participant got the correct answer from watching old movies, this is most brilliant. The other asked from someone who is really very knowledgeable. One says Shakespeare (a 28 rg 6 &15/16 panatelas). He quoted from the Cigar Insider Nov. 98. I will also take that as correct. None of recent books (i.e. after 1990) I have read mention that once the long slim panatela was popular. Most say that coronas was the most popular ever. J.B. Back thought that coronas were the most popular, the panatelas were only rising in trend. Which opinion should you take? The best reference comes from cigar manufacturers, as they care to know most. The next best reference comes from cigar vendors, as they have first hand experiences. The next is Robert K. Heimann's book, as the information was second-hand (nonetheless he got it right, this proves how serious he was in his research). Reference is not good from J. B. Back's book as he is a connoisseur and was never a manufacturer or a vendor. So he would not know. Recent books typically copy from recent books and magazines. They are the worst. If you have conflicting information, trust the one from the source who can know and is most interested to know! The tobacco which were used to blend the Diplomatic Cohibas came from how many Vegas? (References need to be provided). Four. Again, I insist that answers which came with a reference are accepted. Otherwise this again becomes a lottery game. Only one got it by searching the original article in the Cigar Aficionado website. One got it from a commercial website quoting Avalino Lara. The remaining two got it from Chase and Bati's 'The Cigar Companion' where Avalino Lara was also quoted. Many got the correct answer from other sources, but they are not accepted for reasons discussed below. When you get a piece of information, not only you have to know the source it originated from, but you should know the expiry date of that information. Theoretically, the expiry date was the moment the interview was over. But practically, it was the day that person was no longer in charge. Unless further information comes up to support that information. Avalino Lara has left Cuba. Rumours were that he was not satisfied that quality of Cohibas suffered from over production. All sources which quoted the figures without mentioning Avalino Lara refers to ordinary Cohibas but not Diplomatic Cohibas. Indeed I am very skeptical about the fact that the tobaccos used for Cohibas can now still be coming from five Vegas only, because of the additional Siglo sizes introduced 1994. The books which quote the figures without referring to Avalino Lara are likely to have copied from that article, but in any case all do not quote the source and discuss about the expiry date for the information. The Fonseca Invictos has a peculiar shape. Does it serve a purpose? Or is it just for fun. The Fonseca Invictos has the most unique shape of any Havanas still in production. It had a pointed foot and a blunt end! Another subtle peculiarity is that it has a unique concave (or curved in if you like) pointed foot. Other cigars with a pointed foot are all convex (or curved out if you like). An interesting observation is that it is very gently tapered. But I do not consider that peculiar. Whether that shape serves any purpose I cannot know for certain. As Fonceca died in 1930 and I cannot ask him. But a very good speculation is that the pointed foot, as we all know, serves to make the cigar easier to light, as blow torches were not available in those days. The concave foot seems to be for making you to reach the right ring gauge faster as there is less tobacco in the pointed foot. The blunt end probably tells you where exactly is the correct ring gauge to cut the cigar. Most people say that a tapered end serves to provide a 'more concentrated flavour'. I think this is another pseudo-intellectual comment. The smoke which comes out from a tapered end is indeed more concentrated, but it is due to 'compression'. When it reaches you throat it has already been 'decompressed'. The tongue has no flavour sensation. It can only detect sweetness, saltiness, sourness and bitterness. It can also sense hotness, coldness and lastly pain! The 'concentrated' smoke serves no purpose except causing hotness, bitterness and even pain! It might serve to give a sweeter taste but I am not sure. In any case you smoke a cigar not mainly for sweetness, a piece of candy or chocolate is much sweeter (and cheaper!). Or alternatively you can drink something sweet while smoking. It is really the tapered body which can serve the purpose of concentrating the smoke. As more 'residues' are deposited in the body after each puff. But overdoing it probably creates a hotter and harsher smoke. The tapered end serves to allow the smoker to cut the cigar to the ring gauge he finds most comfortable in his mouth. None! Anyone who can name the pointed foot and the blunt end would have been considered correct. The concave tapering of the foot also. But I must say it is quite difficult to spot. The explanation is not important, as I am only speculating and your speculation is at least as good as mine. This question was designed to make sure at least there are some winners. Why is it so difficult to spot a feature which is so obvious? Curious! The Invictos are difficult to get but pictures of it are everywhere. At least Cigar Aficionado has shown it in one of their ratings of figurados. Sometimes the answer to anything is there in front of your eyes, the only hurdle is to observe. But curiously nobody did. How can you grow tomatoes in your garden with nicotine in their leaves? Nothing high-tech required. I got this from the Encyclopaedia Brittanica. Now you do not have to buy a whole set! They are on line and you search 'nicotine' and than go to 'synthesis'. With the internet you can search a lot of things. The Encyclopaedia Brittanica is a very good source among numerous others. Which single cigar still produced has the most unique foot? The Fonseca Invictos again! Not only it has a concave foot, if you observe very carefully the foot is made of a different piece of tobacco leaf. The wrapper of the body then wraps it 2/3-way in the tapered foot. Absolutely unique! If you observe more closely, you can find a lot of funny things to amuse yourself! What is the most unique feature of the Siglo XXI Humidor which makes it stands out from any humidors ever produced? It comes with an electric plug! A lot of people who have money to buy the humidor were put off by the problem of storage. You really need a very big room-sized temperature-controlled 'walk in humidor' to store it. When they arrived in Hong Kong it was a pleasant surprise as this was not mentioned in the promotional pamphlets. While this is a pleasant surprise but unpleasant surprises are much more common. The Siglo XXI Humidor does not have a no quibble guarantee for obvious reasons. But for ordinary cigars, buy only from vendors who offer a no quibble guarantee, if you cannot see them. Which cigar has the most unique packaging form ever? According to the logic in Question Two of the Competition the answer should be 'don't know'. But I spotted from older catalogues the Sancho Panza Tronquitos came packed within a tubular natural tree trunk drilled hollow (cedar trees I guess). In the book 'Cubatobacco Luxurious Cabinets' (from Cubatobacco, date unknown) the name of this kind of packaging is called Presidencial and contains 50 or 100 Coronas. The book does not say which cigars are packed in this form. Which year is the peak of cigar consumption in USA? Peak year of consumption per capita : 1907, 86 per capita. Please note 'capita' includes the entire population. If you exclude women, children and non-cigar smokers, the figure is potentially really frightening. Peak year of number of cigar consumption : 1910 , 8.3 billions. Another frightening figure. These figures are frightening but trustworthy, as they are official. A lot of figures come with no reference (references are usually listed at the end of the book, or sometimes at the end of chapter). If there is no reference quoted. Be very skeptical. No one gets more than two correct answers. 3 persons got two correct answers. 4 persons got one correct answer. I have adjusted the prizes slightly. All persons who got Question Two correct get the third prize. The three persons who got two correct answer get the fourth and fifth prize. The three persons who got Question Two correct get the additional third prize. All four persons who got one correct answer get the fifth prize. The questions were indeed very difficult (Except the Fonseca Invictos!) but nonetheless I think they were fair. All correct answers require no access to particularly difficult to obtain sources. You can argue that the answer to Question Three requires access to old books. You don't need to. Just ask your (or somebody's) father or grandfather and he could probably tell you the correct answer. I have adjusted the prizes slightly, all people who got Question Two correct gets the third prize. There is no limit to the maximum number of third prizes. The ULTIMATE WINNER of this Competition goes to a gentleman. He only answered two questions. As he did not answer Question Two he has already got one question right. And he supplied the most brilliant answer in this contest. He got the answer to Question Three right by watching old movies. He provided the best reference ever, his own correct observation. As I think he is a gentleman who does not care for material rewards. I will make a special certificate for him to certify that he is the ULTIMATE WINNER to this Competition. Nonetheless, he is awarded the third prize, fourth prize and the fifth prize which he indeed very much deserves. For those who do not get any prize, thank you for your participation. I am planning to do at least one more competition before I go. In fact, the August question on colour of cigar ashes has been reserved for this purpose. William Stewart answered two questions correctly, question 4 and he didn't answer question 2! Robert Eads answered two questions correctly, question 3 and he didn't answer question 2! Readers who can come up with five correct answers : a box of 1982 Romeo Clemenceaus. (A 1988 example was recently sold in the July Christie's auction for (Â£1,400.). One prize only. Readers who can come up with four correct answers : a box of July 2000 Ramon Allones Corona Gigantes. This is only the second time EVER that 10 boxes have been imported by the Pacific Cigar Company. I was only 'rationed' two boxes. Two awards only. Readers who can come up with three correct answers : a stick of Cubatobacco 25th Anniverserios. It was produced in 1986 and only 100 boxes were produced. It is estimated that less than twenty boxes survive now. Three awards only. Readers who can come up with two correct answers : a 1992 and a 1995 Cohiba Robustos for you to compare. My 1995 box is the last batch of 'old blend' produced. Four awards only.